It’s no secret I like using colouring pages for learning activities ( the flower number bonds and doubling and halving butterflies were made using colouring pages), they just seem to add a bit of fun to something that can sometimes be a bit boring. A little while ago I noticed that the peacock colouring page from Activity Village had 12 feathers (excluding the center one which is obstructed by the peacock’s head). And when I find something with 12 items/ objects on it I always start wondering if it can be used with times table/ division. As my son has been learning his 5 times table I printed out 2 copies and thought we could use them but we were beaten to the activity by my daughter. She thought it would be best if she tested out a page first (ie I think she was wondering why she did not get to do peacock times table pages when she was learning her times table) so she made a 9 times table version as an “example” for her brother. He liked the idea (anything to do with animals is a big winner in our house) and happily made his own 5 times table peacock. It really is nothing complicated, the kids just wrote out the times table sums on the different peacock feathers. But for kids who are just learning a new times table like my son it is good practice. And he actually asked if we could pin-up his 5 times table peacock on our maths notice board (just a board in the kitchen with some maths posters on it). He even suggested that I should create a peacock with mixed up 5 times table sums on the different feathers for his Monday maths. I liked his idea so I have already made one for him. 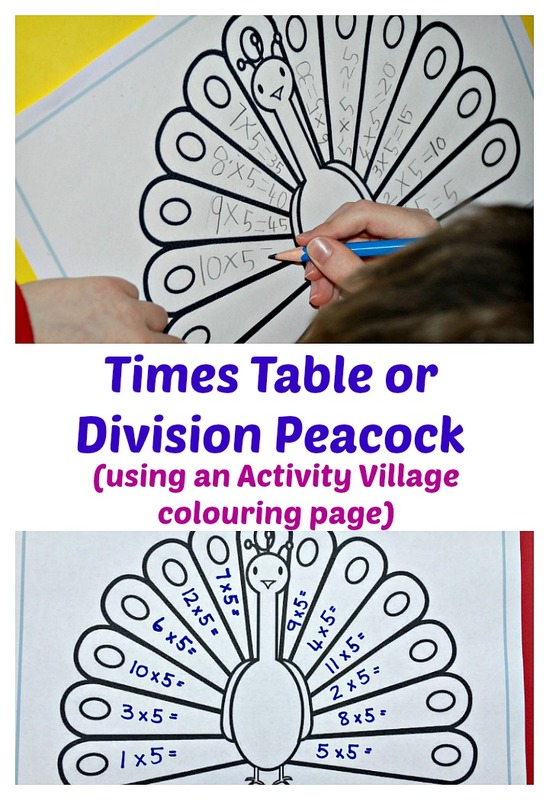 I have a strange feeling with we might end up with a board fill of Peacock Times Table pages (he just walked in and informed me that he needs to create one for the 2 times and 10 times which he already knows). This entry was posted in maths ideas and tagged activity village, home ed, home education, homeschooling, ks1 maths, maths activities, Times table. Bookmark the permalink.